“We don’t serve their kind here!” Uttered by Wuher, the barkeep in the Mos Eisley cantina, those words establish the peculiar place that droids inhabit within the Star Wars galaxy. At a glance in any visual medium in the franchise, comic book, animation, or film, droids are omnipresent. You see them in the service of the Rebel Alliance, aboard the Death Star, and patrolling the hangar bay of the First Order. Our favorite pair, R2-D2 and C-3PO, are saved from the rolling droid horror of a Jawa transport by the need of moisture farmers for droids. In short, droids have become indispensable to the way of life of billions in the Star Wars galaxy (they now have a cherished place in what we expect from our Star War stories, even). Despite this very fundamental role, they are treated along a spectrum which borders from friendship to tool to nuisance. Across the seven films, very few of the characters express concern over their well being. In A New Hope, Artoo is in the thick of the Battle of Yavin, but only two characters ever express any concern over his well being, Luke Skywalker and C-3PO. This lack of concern is specifically highlighted by Lucas the moment the astromech is hit by enemy fire and Luke reports it via a comm channel to the rebel headquarters. In a room of humans, including Princess Leia, the only reaction to this news is C-3PO, the rest simply process it as if some other mechanical element of Luke’s X-wing had been damaged. Skywalker, to his credit, asks about the droid almost immediately after he lands. Luke’s attachment to Artoo continues into The Empire Strikes Back in the swamps of Dagobah, and it’s also in the same film we see the only other non-droid character appear to truly care about a droid, Chewbacca. 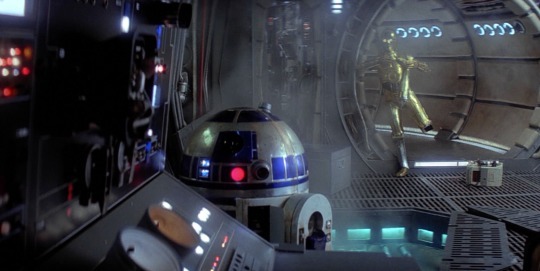 Very shortly after Han, Leia, Chewbacca, and C-3PO arrive on Cloud City, the golden protocol wanders off into a room, believing he heard R2-D2. Instead, he finds a gaggle of Stormtroopers who helpfully blast him into a number of pieces which are unceremoniously sent to the city’s rubbish dump for incineration by Ugnaughts. Granted, Leia does offer something of a worry about his whereabouts, it’s Chewbacca who hunts C-3PO’s parts down and rescues him from death by plasma. Later, the wookiee takes up the task of putting the protocol droid back together and carrying him on his back for the final act of the film. 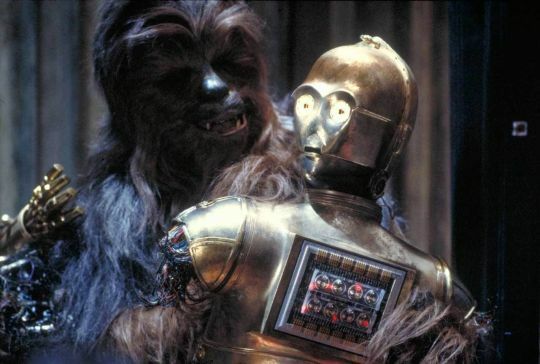 The Original Trilogy ultimately wraps up with R2-D2’s electrocution outside the blast doors to the shield generator on the forest moon of Endor, and again, only his gold plated friend reacts with anything other than a shrug. That this happens so far into the adventures of our heroes may imply that at the time of shooting the scene, it was just not deemed important enough to have Han and Leia react anymore than the way they did. And in a way, it’s as if the real world reflects the fantasy one, reducing droids to simply props or tools to perform a task. The generally unappreciated service and role the droids play in the Star Wars universe has in recent years generated comparisons to slavery. Can droids, or better put, robots, actually be enslaved when they are simply machines built to serve one purpose or another? Can one be enslaved if one is programmed to do only what one does from the moment of birth? These are deeper questions than perhaps the Star Wars franchise has had a chance to answer, but what we do know is that restraining bolts are a thing. Why would programmed machines require restraining bolts, devices which force a droid to obey the command and will of their masters? It either implies that droid programming is so complex and intuitive at the same time, that a droid can logically find ways through its programming to act independent of its owner, or that simply droids are sentient and endowed by programming or other means with a free will that requires, at times, the brute force of additional adherence, a proverbial leash. These ideas are actually part of the subject of the Marvel Comics one-shot issue, C-3PO: The Phantom Limb, which was released in spring, 2016. 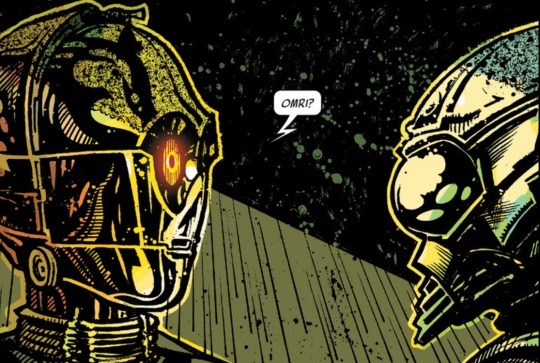 Nominally advertised as the answer to why the protocol droid had his red arm in The Force Awakens, the comic written by James Robinson, the story serves something as a rebellious rebuke of how droids are treated in the Star Wars galaxy and ponders the question of free will versus programming. In short summary, a Resistance ship crash lands on a hazard filled wasteland of a planet, killing all the crew. The only survivors are five droids, including C-3PO and a captured First Order protocol droid, OMR1. The droids are forced to travel across the landscape to find a downed First Order ship to use its homing beacon to call for Resistance help. One after another, three droids are killed by indigenous horrors and barriers. As they perish, OMR1 and C-3PO debate how much of their sacrifice were truly sacrificial versus simply programmed, or better put, free will versus design. This struggle to identify the purpose of their existence on either side of the brewing galactic war as programmed versus voluntary is a key theme which is joined by OMR1 engaging in a conversation with C-3PO over how both have suffered multiple memory swipes, and how, in effect, with every swipe they begin a new life. Yet, these new lives are haunted by ‘memories’ of past ones, like fragmented data that exists until overwritten. How much are either droid themselves or simply the creation of their masters? Do they have that free will or is it a programmable illusion? The comic concludes with OMR1 stepping out into acid rain, sacrificing himself for C-3PO, to activate the beacon. As the rain slowly eats away at the droid, his black lacquer melts away to reveal red metal plating, a final surprise to the First Order protocol droid who had no memory of being a red painted droid. Before his death, OMR1 tells C-3PO vital information on the location of a valuable Resistance prisoner, and in the process, uses his death to underline that droids do possess a will which overrides programming. C-3PO takes one of OMR1’s arms to replace one lost to the planet’s creatures, and in effect, a visible reminder of a droid’s free will. An a Season Two episode of Star Wars Rebels, “The Forgotten Droid,” another droid in the service of the enemy, this time the Galactic Empire, is also given the opportunity to choose free will over programming. 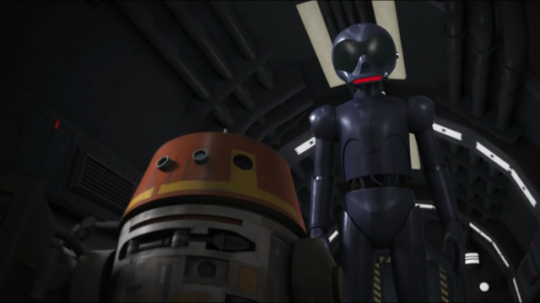 In this case, the droid is AP-5, a veteran of the Clone Wars and droid which specialized in military strategy. Two decades later, AP-5 is relegated to inventory duty on an Imperial freighter and treated poorly by the Imperials who man the ship. When the Rebels astromech Chopper happens upon the ship, he engages in his own discussion about free will, albeit partially in non-verbal machine noise, with AP-5. Unlike OMR1, AP-5 does not ultimately choose his destiny to help Chopper, that is, until a restraining bolt is removed. While at least recently, the stories of the Star Wars universe have heavily emphasized that at least some droids possess a will powerful enough to overcome their makers’ intentions, we can always return to the mechanics shed on the Lars homestead on Tatooine. Through guile, a blue and white astromech convinced his erstwhile owner to remove the one thing which prevented it from doing what it wanted, not what its owner desired. One might argue that R2-D2 was acting as the rightfully owned droid of Captain Antilles of the Tantive IV, but C-3PO, ever the protocol droid, noted Captain Antilles as their previous owner, acknowledging the Lars family ownership over the pair of droids. So from the beginning, we can appreciate the idea that droids can and do think for themselves, despite whatever their programmed intention or master commands. Furthermore, from the beginning, their place in Star Wars society, essential and dismissive all at once, has always remained the same. In The Force Awakens, the cinematography of the initial scenes of Rey invokes a sense of solitariness. She lives on Jakku, trades in Niima Outpost, but her life is one of singular loneliness waiting for the return of those who love her. The first time she breaks out of this mold comes when she hears a droid’s distressful cry and rescues BB-8. Repeatedly, Rey reveals concern for the round astromech, fixing his antennae and refusing to sell him for a wealth of rations. The Force Awakens, our most recent Star Wars film of the 21st Century, offers a more encompassing list of heroes who do care directly about droids, be it Rey or Poe Dameron. Yet, at the same time, it’s also a film which takes C-3PO’s red arm, a veritable badge of independent will, and nonchalantly replaces it by its conclusion for no reason other than aesthetics. Two steps forward, one step back? Nonetheless, as we move forward with more films, more episodes of Rebels, more comics and novels, droids will remain a prominent fixture in the Star Wars storytelling landscape. How they are perceived, treated, and respected, within that universe and ours will remain to be seen.